Managing the abundance of greens from a CSA or an overflowing garden can be a challenge. Your own garden gives you the flexibility of when to harvest, but a CSA haul challenges your refrigerator, and your ingenuity. As I’ve written before, I’ve learned to prepare the most voluminous vegetables first: spinach, chard, and beet greens, for example. Recently, with a weekly pound or two of chard from our CSA, I have had to stay on top of the situation. And it takes some planning to use it up before the end of the week, despite how many frittatas or tartines or grilled cheese sandwiches with greens or pasta dishes you can throw together impromptu. 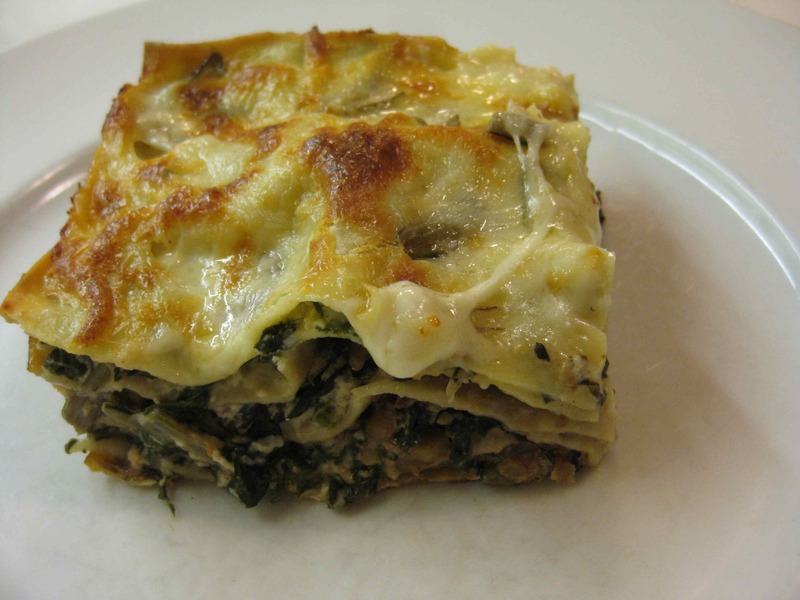 Since I had fresh sheet pasta on hand (wish I’d made it but I didn’t), I searched my farm journal for a certain chard lasagna that I once made at this time of year, and turned up nothing. Drat. No master index. 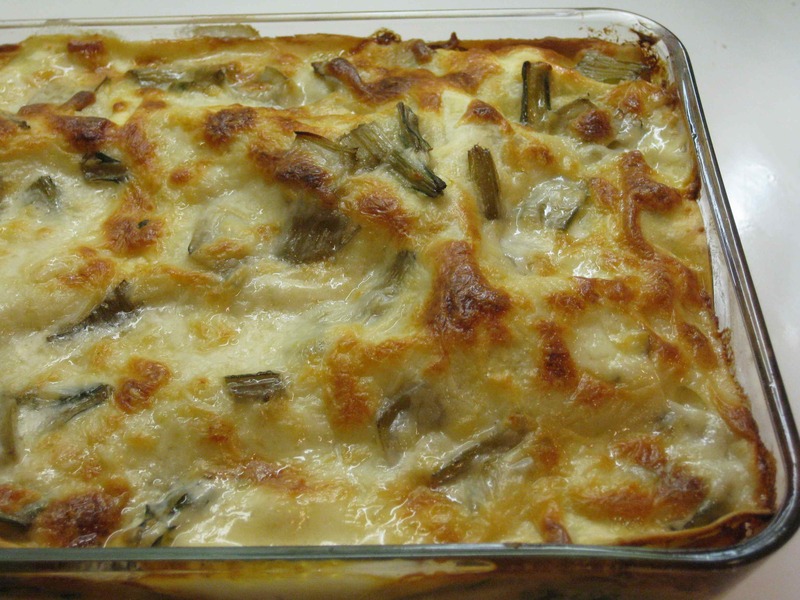 But I did find a note about this lasagna, which is a riff on a recipe from Deborah Madison’s Local Flavors. That book had me hooked just by the title. She toured farmers’ markets throughout the country and wrote about what she bought and cooked. I admit that whenever I travel, I seek out markets and even grocery stores to get a sense of local culture and values. Pretty revealing. From the marginalia in the book (I write lots of notes in my cookbooks), I seemed to have followed her course pretty closely because I was intrigued with her use of no-boil noodles, apparently novel to me at the time, and the solution to use milk as a moistener (and no eggs in the filling). I’ve noted how to adjust for pasta type in the recipe below. Here, I used fresh pasta sheets, the stems of chard in addition to the leaves, grated nutmeg for enticing allure, and otherwise so altered Madison’s recipe that I now can attribute only the inspiration. But with her brilliant way with vegetables, that’s a high compliment. Prepare the chard. Wash it thoroughly and cut the leaves away from the stems. Cut the stems into slices or matchsticks, depending on their size and shape. In a large saucepan, wilt the chard with the water that clings to their leaves (or if large or old, add ½-1 cup of water to the pan to shallow-boil them). Remove to a sieve to drain, capturing the liquid. Add the liquid back to the saucepan and shallow-boil the chard stems. By the end, you should have some liquid, probably less than half a cup. Save this to moisten the lasagna filling. When the chard leaves are cool, squeeze out the excess liquid and chop them coarsely. You can prepare the chard well in advance, storing the chopped leaves and stems separately. When you are ready to make the lasagna, heat the oven to 350 degrees. Put a large pot of water on to boil (for the lasagna noodles, see notes below). Lightly oil a 6-cup glass pan (approximately 6×8 inches) and sprinkle it with milk (the oil and milk will not mix, but the milk will help moisten the lasagna noodles). Toast the walnuts in a dry pan and set aside to cool. Chop them medium-fine. Prepare the filling. Set a few tablespoons of chard stems aside. 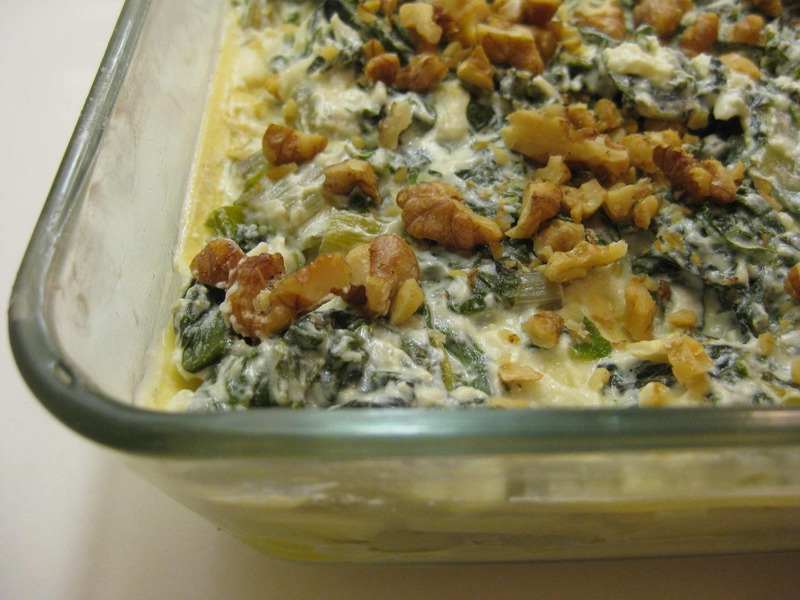 Combine the remaining chard stems and the chopped leaves with the ricotta cheese and add the Parmesan cheese and half the mozzarella. Add a little chard cooking liquid or milk if using fresh or no-boil noodles. Season with a little salt and nutmeg if desired, remembering that the cheese may contain ample salt. Prepare the noodles. If using fresh noodles, dunk them in lightly boiling water for a few seconds before placing in the pan. If using no-boil noodles, do the same, but for about 30 seconds. When you place them in the pan, you will need to sprinkle them with a little milk in addition to the filling, or add it to the filling. If using dried noodles, cook them until they just start to become tender. You don’t want them mushy or the lasagna will be watery. Sprinkle the top with the reserved chard stems and remainder of the mozzarella. Bake for about 40 minutes or until bubbly and browned. Cool for 10-15 minutes before cutting and serving. Just found your blog via food in jars–so much great stuff here!